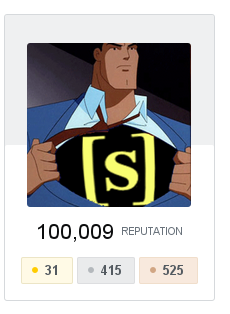 We've just reached a milestone: User Oddthinking has reached an incredible 100k reputation! I would like to congratulate Oddthinking with this major achievement and his unparalleled contribution to Skeptics. Congratulations! Up to the 200k! FAQ: What constitutes original research? Registering one's opinion with a low reputation? Should “downvotes” require comments to actually count at Skeptics? US Election 2012 & Skeptics. We need your input! Is the “Citation Needed” name off the table? Too many links in a first timer's answer? Should the reputation for close/reopen be reduced?